Some more recent words to ponder. This was my first peak in 2011...yes I am guilty of not hitting the mountains for over 4 months but hey, I was really brand new to snow climbing less than 2 years ago. I had to borrow a lot of gear for this cold, windy snow climb! I was reminded of Washington on this one which I enjoyed. As described in my previous trip report...I really needed to hit the mountains. I hadn't been anywhere in the mountains since December while I was back home in WA for Christmas! 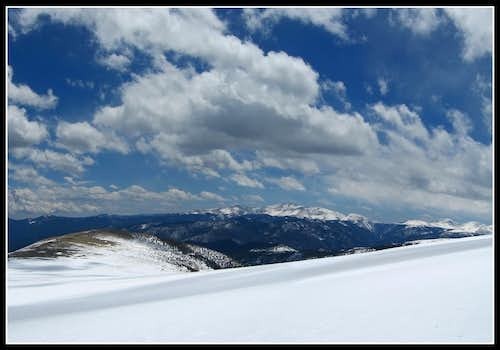 For my first mountain summit of 2011 we went out to tackle James Peak in the Front Range last Wednesday. 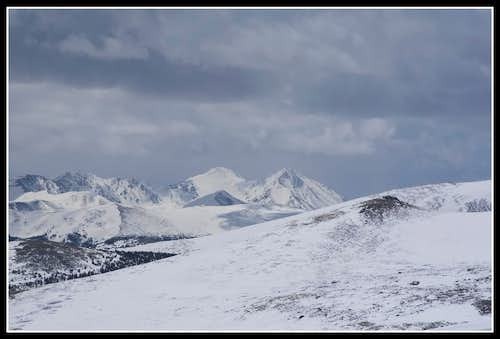 Three of us went and lets just say it was a very fun adventure of wind, clouds, snowshoeing, route finding, post-holing, and to our surprise...a lot of great views. The drive up to Alice from Golden went fast and we were hiking by 7. I was surprised how short the walk was to the lake at the base of St. Marys Glacier. It was still frozen and we could barely see the glacier from the lake due to such thick clouds. We started around the lake and headed up the glacier. If you are from WA like me you know this is the biggest joke ever. It isn't really a glacier and in fact, no more glaciers exist in CO! Didn't need crampons or snowshoes to ascend it...it was nice and firm. This was actually the easiest part of the climb. The next part of the climb really sucked as there was a mile of flat walking through snow just soft enough to annoy you but not soft enough to take the effort to put on your snowshoes. The cloud layer was maybe only a few hundred thick as we could see the ball of light that is the sun right through them. We hoped that at the summit we'd be above the clouds and get some views. 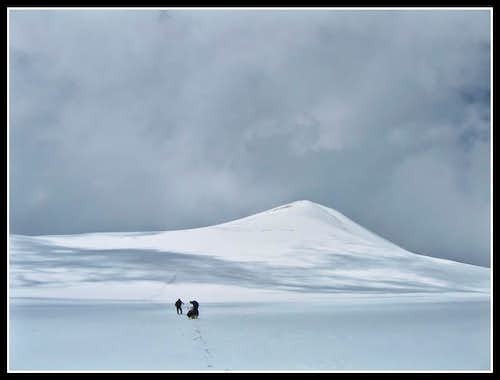 At the base of the final 1200 foot climb up James we stopped for a snack and to put on snowshoes. A short section required them but by the time we got to the steeper part of the climb the snow was firm enough to walk on. We got a little disoriented and ended up climbing up the north ridge of James right along some cornices. Areas of rock outcroppings within the mass of snow helped speed things up. We finally saw the infamous 4 foot carins below us just as we summited. Visibility wasn't improving much and the only thing we saw at the summit was ourselves! It was very nice though as the winds died down and it was pretty warm. We sat at the top for maybe 15 minutes hoping it might clear up. When we realized it wasn't, we started down. To my surprise though, once we descended a few hundred feet, the clouds lifted and we saw our first views of the day. "HOLY CRAP" I remember saying as the clouds quickly lifted away and revealed to us the whole Front Range. 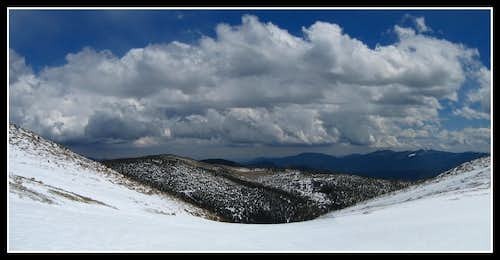 We didn't get to see anything to the west but the views we got on the descent were fantastic. I kept running down the soft snow about a hundred feet and then stopping to take a bunch of photos. Once we got back down to the large flat area the sun was shining nicely. It was a long one mile slog back to the top of the so called glacier but it never got bad enough to put the snowshoes back on. We finally made it back to the glacier where our final descent lay ahead of us. 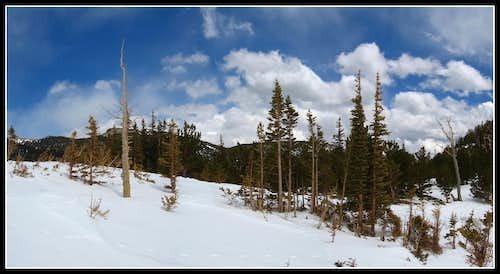 We were hoping there would be a nice glissade here but the snow had softened enough for only a 50 foot slide. The day turned out to be very nice though as we made the final hike back to the car down the old road. Same view as earlier in the morning only better! A great way for a Wednesday stroll!